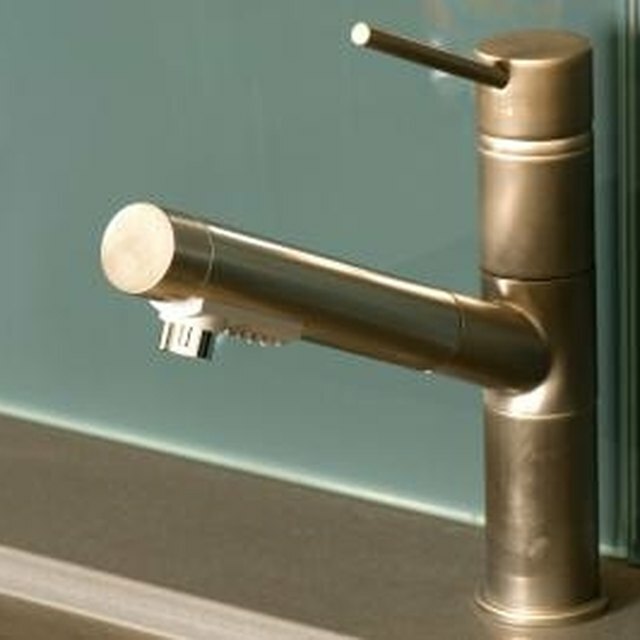 When you take a shower using your Moen spout diverter, the water should exit only through the shower head and not the spout. If the water leaks out of the spout, the water pressure coming out of the shower head drops. Correcting the leaking diverter takes only a few minutes of work. Moen does not sell repair kits or parts for leaking diverters that sit inside a tub spout. When the diverter in the spout begins to wear out, you need to remove the entire spout and install a replacement. The diverter in a tub spout does not wear out often, so you will not need to replace the bathtub's spout on a regular basis. Inspect the underside of the spout. All Moen spouts have a cutout on the underside of the spout where it contacts the wall. If the cutout has a small screw in it, remove the screw using an Allen wrench before you remove the spout from the water pipe. If you do not see a screw, turn the spout counterclockwise to unthread it from the water pipe. When you go to the store to select a replacement for your old Moen tub spout, take the old spout with you. You must find a replacement that attaches to the water pipe the same way as the old spout, otherwise you will not be able to install the new spout. The new spout must also have the diverter in the same part of the spout as the old spout to ensure the diverter works without problems. As long as the diverter sits in the same part of the spout and it attaches to the water pipe the same way, you can purchase any style or design you wish. Before you install the new spout on the water pipe, you need to guard against leaks. Wrap plumber's tape clockwise around the pipe's threads if you had to turn the spout counterclockwise to remove it. You do not need to use plumber's tape if the spout uses a screw to attach to the water pipe. You then only need to install the new spout by reversing the removal steps. With the spout attached, turn on the water and pull up on the diverter's handle to ensure it works properly.